Is The Premier League Title Already a Two Horse Race? 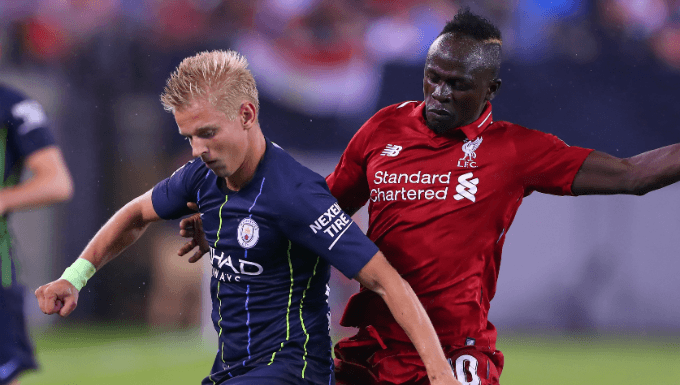 Manchester City and Liverpool’s early exchanges have tipped them both up as the teams to follow in the Premier League title-race this season, but can anyone else challenge them? Just days into the 2018/19 campaign, is the Premier League already a two-horse race between last year’s Champions Man City, and last year’s Champions League finalists, Liverpool? Pep Guardiola’s Man City ran away with the Premier League title last term, finishing 19 points above second place Manchester United, in what was a non-contest for most of the campaign. The Citizens blew their opponents away with liquid football.. They also showed the strength in depth to be able to challenge in other competitions, and not lose their way throughout the fixture congestion. Liverpool, under Jürgen Klopp, did not flinch in Europe either. The Reds reached their first Champions League final since Rafa Benítez led them to their triumphant win in 2005. On route, they knocked out Man City in the quarter finals of the tournament, but failed to deny Champions League Goliaths Real Madrid a third successive victory. They did, however, slip up at home, letting games go to record just 21 wins in the Premier League. It was a performance which saw Liverpool finish a distant fourth to Man City, accumulating just 75 points. The challenge for Liverpool this season then, will be to see whether they can maintain the consistency of quality needed all year round, and not just produce it twice a month in Europe. After such dominance last year, Man City are a top price of 4/6 to win the Premier League title again, with Paddy Power. Their opening two games - one in the Premier League, and one in the Community Shield - have been a breeze for Guardiola’s men. In Arsenal and Chelsea, they faced two sides not yet up to speed with new managers, and soundly beat both. Yes, there is no better time to play those two heavyweights than now, but Man City made it look easier than ever. Even without Kevin De Bruyne and captain Vincent Kompany, they excelled and were constantly on the front foot. The damning news for all City fans though has been the injury to De Bruyne, who is likely to miss at least two months of action after twisting ligaments in his knee - a similar injury to that which he suffered against Everton in 2016. For most teams, fans would rightfully be worried over losing their best player, but with City and their immense quality throughout the squad, they have other players - like the two Silvas - who can step up to the plate in the Belgian’s absence. Where some teams fall after winning a major honour, others rise. Complacency can creep into the players’ games as they rise to the top of the ladder without contest, but Guardiola will not let a team fall apart so easily. The Spaniard has repeated on many an occasion that if he feels that his players are not as hungry as him anymore, he will walk away - just as he did at Barcelona and Bayern Munich. It is no wonder why they are once again favourites to lift the trophy. For the first time in a decade, Liverpool has a well balanced squad that complements all its moving parts. A terrific summer transfer window for The Reds saw Klopp add Brazilian goalkeeper Alisson from Roma, winger Xherdan Shaqiri from Stoke, defensive star Fabinho from AS Monaco and midfielder Naby Keïta from RB Leipzig. By spending €182.2million, Liverpool have put together a squad which suggests they are really putting everything into trying to secure the club’s first Premier League trophy, and they have already reaped the rewards, romping to a 4-0 win against West Ham. Jordan Henderson, Daniel Sturridge and Shaqiri made a sizeable difference when coming off the bench in that test, a sentence that would never have been written a few years ago. Back then, the Reds would turn to their bench, and the quality simply would not be there, but now they have a platform in which rotation is not a weakness. Klopp’s style of football enables Liverpool to constantly be on the front foot and score handfuls of goals in each match; the German manager has also made great strides in stopping the leak in his back four, after bringing in Virgil van Dijk from Southampton. Although they fell short of European success last season, Liverpool’s players have added a great deal of fuel to their self-belief in attempting to win major honours, and that can this season carry forward into the Premier League. It is the trophy that Klopp will be angling towards over any other this season and they are clear second favourites because of that. The new-look Reds are no bigger than 10/3 to win the Premier League title with William Hill, which could look incredible value in a month’s time. So, Is There Any Other Premier League Contender? At the head of the Premier League betting, Man City and Liverpool sit alone, their nearest challengers Manchester United, Chelsea and Tottenham given odds as big as 20/1 with Black Type. It certainly looks like the Premier League is going to turn into a two-horse race, but it would be a mistake to write off the likes of Chelsea and Manchester United, who appear the best contenders from the rest. Yes, draw a line through Tottenham and Arsenal for now - they do not have the quality in their squads to go all the way and be crowned English champions - but consider the others, especially at those huge prices. Alternatively, Arsenal are available at 5/2 to finish in the Top 4 with Black Type, while Tottenham are a best price of 4/5 to finish in the Top 4 with William Hill. You can never truly tell how a Premier League season is going to pan out given the wide set of variables that can occur, but Liverpool and City’s squads, managers and club ethos' appear to be in perfect harmony, which would suggest they are best poised to lift the prestigious trophy. There will be challenges along the way, but they should have enough quality and experience by now to overcome them and lead the charge.